Unfair is a fascinating book and well worth your reading time if you have even a passing interest in the U.S. justice system. 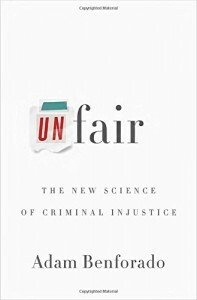 Benforado makes a compelling case based on recent advances in psychology and neuroscience that many aspects of our justice system are, as the title says, unfair. Eyewitness testimony has been shown to be notoriously unreliable. Memory turns out to be malleable, not just fading, but actually changing over time. Unconscious bias based on race, weight, appearance and other factors affects the perceptions of everyone from police officers to judges to jurors. Even confessions can be unreliable indicators of guilt. As a result, we are imprisoning a shocking number of innocent people. DNA testing has exonerated hundreds of prisoners, yet DNA evidence is available in only 5-10% of serious crimes. The case for reform is crystal clear. When the book leaves the courtroom to diagnose broader societal ills, I question Benforado's conclusions. He makes a convincing case that some criminal activity is essentially involuntary. One third of our prison population, for example, consists of the mentally ill. Drug addiction has been shown to have a genetic component. And perfectly normal people who suffer a particular kind of brain damage become pedophiles, but revert to normalcy once their brain function is restored. For this type of criminal, treatment is far more effective at protecting society than punishment. But Benforado generalizes from these cases to assert that all prisoners should be treated, rather than punished, and that pure evil does not exist. Human beings are messy and complex--isn't it possible that some crimes are caused by illness and others motivated by evil? There's ample evidence for evil--thousands upon thousands of murders documented by journalists, authors, and filmmakers. Reading just one book--In Cold Blood--was more than enough to convince me that yes, evil does exist in the world. Punishment is a perfectly appropriate response to such crimes. Benforado turns his gaze admiringly to criminal justice systems in Germany and Norway that are focused on treatment. But he fails to adequately address the fundamental difference between those societies and the U.S.--poverty. No amount of tinkering with the prison system will prevent crime if prisoners are returned to the same economically challenged and violent neighborhoods that they came from. Also, there are only a few brief paragraphs on the most unfair aspect of our courts. The wealthy access a completely different court system than the poor. There's a world of difference between the "justice" given to someone who can hire the best attorneys and trial consultants and someone who has to rely on an overworked public defender. Despite these quibbles, many of the solutions Benforado suggests can and should be implemented in the U.S. Drug courts and mental health courts are already working in many jurisdictions, and should be expanded. Trials and police procedures should be reformed to capture eyewitness testimony accurately and to place less emphasis on it. Questioning techniques that produce false confessions should be banned. Unfair is an important book, one that I hope will be widely read and discussed. Benforado does the country and our system of justice a true service by presenting the science related to justice in a clear and compelling way.